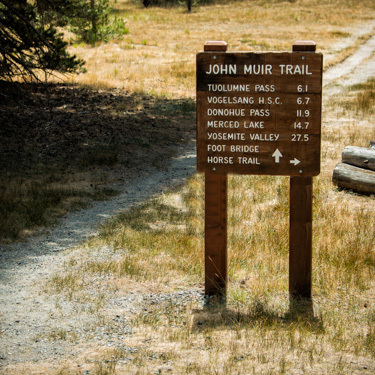 On this blog and in my book I attempt to realistically describe the risks associated with a thru-hike of the John Muir Trail. It’s been my experience that many people, particularly those unfamiliar with the Sierra Nevada, vastly miscalculate what the real risks are. For the uninitiated, the number one fear is bears, and the number two is running into another hiker with a nefarious agenda. While neither can be totally discounted, both should be well down the list of concerns—perhaps next to being snowbound in September or being hit by a car while crossing the Tioga Pass road. The real risks are far more prosaic: falls, drowning, heat injuries, and high altitude illnesses. For just about everything you need to know about the latter, I strongly recommend you read An Unofficial Acclimatization Guideline for JMT Hikers: Things to consider when planning your JMT hike, by Leslie Rozier (DNP, APRN, FNP-BC) and Kenny Meyer. This nineteen page PDF is the perfect tool for the John Muir Trail hiker and it should be mandatory reading for anyone who is unfamiliar with Acute Mountain Sickness (AMS), High Altitude Cerebral Edema (HACE), and High Altitude Pulmonary Edema (HAPE). Even for those who have more than one high-elevation hike behind them, there is plenty to learn. Although the document is heavily footnoted, has a significant list of references, and has more than a few words you probably do not use in casual conversation, it is written in a clear and concise style. A layman will find it easy to understand. It’s also comprehensive; with the exception of clicking on a link to the Lake Louise Score (a simple, five question test for AMS) I didn’t feel I needed to read anything but this one reference. Topics include descriptions of AMS, HACE, and HAPE; ways to better acclimatize; medications one may consider; the proper response to altitude sickness; and, perhaps most helpful, an example of a hike-plan that incorporates acclimatization. I have a few minor quibbles: I would have liked to see the Lake Louise Score guideline included as an appendix (instead of a link), the authors define “very high altitude” as between 3,500 and 5,500 meters and then claim that all John Muir Trail passes fall into that category (not true), and the use of a number of medications (dexamethasone, nifedipine, tadalafil, and sildenafil, for example) is not discussed. Those minor deficiencies aside, this is a tremendous reference that every John Muir Trail hiker, newby or seasoned veteran, should read. If you are carrying an e-reader, it also should be downloaded. UPDATE as of February 2015: this guide has been revised & improved and it has gotten even better. The link, above, still works fine. If you are going to hike the JMT and you don’t live in Denver (or above), you really should check it out! Thanks, Ray, for this great write up. I’m working with Leslie and Kenny to further refine and improve the document and we appreciate your feedback. I fully agree with you that a lot of people miscalculate the impact that altitude can have and probably had more discussion about this than any other topic when I did the JMT last summer. I saw 3 young men turning back after Red’s and one trail friend get evacuated from Evolution for altitude sickness. Thanks for the good work on your blog. It’s a terrific resource on an important subject. Thanks for the comment, Inga! Hi Ray. Thanks for the nod. There’s a lot of information out there. It’s not all consistent. It’s not all accurate. We really wanted to make the document as accurate as possible. I believe the guideline could help someone who wants to do the hike and needs information about how to acclimatize. Your suggestions are well taken. We welcome any comments, suggestions, and corrections. It’s the best way to improve the document. That incorrect factoid about the passes slipped through the cracks–thanks for catching that! It’ll be fixed. I’m a bit concerned about discussing drugs, especially since there’s are really good resources out there for MDs. But, given your comments, I think we might revisit the topic. And, we’d like to include the LLS, but thus far we haven’t been able to track down anyone who could give us permission. We’d welcome any leads. Inga’s joined in and we’re working on a new version. She’s got a lot of expertise helping make some great improvements to the document. Thanks again for mentioning the guideline in your blog. Great suggestions. We will incorporate the CDC link. If we can’t get permission, I could embed reader with a link the LLS. That would surely be better than just a link. If you happen to think of other ways to improve the document, please send them along. Fortunately I never – so far – suffer from any of the problems associated with altitude sickness (fear of heights however is another case – anyone got anything for that?) but I can readily see that even those of us who are not altitude challenged should be aware of the problems, in case we come across anyone on the trail who is and needs our help. If you’re interested, we’ve updated the Acclimatization Guideline. The new version addresses some of the findings in the new WMS 2014 guideline. We’ve also made a number of changes in response to comments from reviewers. We believe is getting a bit better with each Rev. Thanks, Kenny. You folks have really done great work with this. Congratulations on a fine product. I’ve updated my post (see above). Your acknowledgement is really appreciated. It’s done a lot to help give the Guideline visibility.